Manchester City’s gloriously mental barm-ball Mario Balotelli has lost his appeal the against the dismissal he received during his side’s 2-0 win over West Brom at the Hawthorns on Sunday. The FA’s decision means that Super Mario will now miss the Manchester derby tomorrow night, as well as City’s upcoming Premier League games with Birmingham and Fulham. I can’t believe Pies has no story about the big training session throwdown between Zlatan and Onyewu…what’s up with that? cuz zlatan getting into a fight with a team mate, or someone else, is almost a daily occurrence. if he wasn’t such a brilliant player then he’d have no friends in any team any where. I’m assuming Balotelli took notes on his training session with De Jong. Balotelli didn’t do anything. 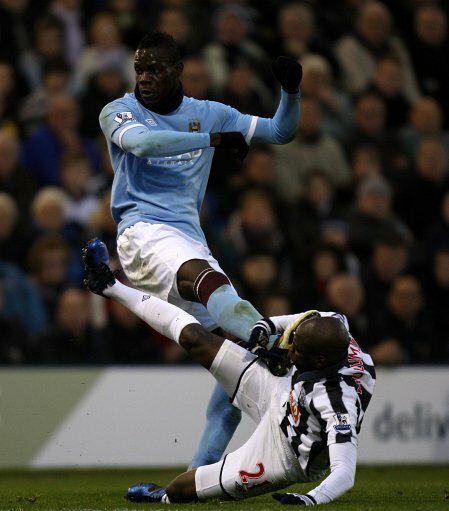 Mulumubu grabbed and held Balotelli’s leg as he went to ground so it looked like Balotelli kicked out when he didn’t. A little play acting by Mulumbu and Balotelli misses the Manchester derby.